Andrew (with the capital "A", not the commenter with the small "a"), directed my attention to Mike Stafford's latest blog entry. 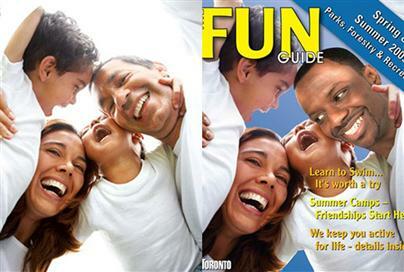 The smiling, ethnically diverse family featured on the cover of Toronto's latest edition of its summer Fun Guide was digitally altered to make the photo more "inclusive," which city officials say is in keeping with a policy to reflect diversity. Judging by the father's gaze, the policy must also reflect a high level of creepiness! As Andrew pointed out, it's reminiscent of an Onion bit. 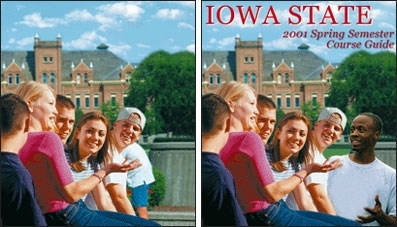 In the spirit of celebrating diversity at Iowa State University, a black guy was digitally added to the cover of the school's 2001 spring-semester course catalog, school officials announced Monday. Our beloved city is now ripping punchlines from the Onion's grasp. Has it really come to this, Toronto? Why just not buy stock photos of a Tamil/Nigerian/all-black/all-Asian/Sherpa in full mountain climbing gear family instead of rushing such a rotten Photoshop job? The worst thing about this is the hand on the child on the left. It was Shopped black. As though leering, broken-necked "Dad" has an eleven foot long right arm. Thanks for the post anyway, Mike. This city manages to handle its diversity well on a daily basis without these cheap, stupid examples of government social engineering. Personally, I think it's very admirable of that black father to stick around and support his family despite his child being born without a forehead. Just to clear Down Goes Brown's good name, he was responding to an Argie comment that's been deleted at his request. I couldn't get over this. Not only is it just silly but it is almost such a poor example of PhotoShop. I don't know what I am more offended by. Scrap that word "almost" don't know why that was there. Woah- I could hardly believe this was real. I took a stab at the cover myself. Photoshop Disasters commenters agree with me that the kid is missing a forehead. You're right, DGB, without the shining sun, the missing forehead makes no sense. Truly a Photoshop Disaster of epic proportions.